Understanding luxury isn’t just about mimicking magazine or Instagram designs, incorporating different metals with cushions at home, or entertaining subtle colors with gold. Luxury becomes more valuable and distinctly upscale because of its originality. Terrazzo in interior design provides just the perfect combination of style and originality. How can one revive luxury just by incorporating terrazzo into the interior design of your home? Stone is a cold, rigid element in design. Without the right accents to the terrazzo floor, the space may look too industrial. To compliment the gloss and shiny finish of terrazzo, one can add accents which are earthy and natural such as wood, wool, greeneries, and rocks in various shapes. These accents can be furniture pieces or rugs, or table accessories. A commonly forgotten element to bring luxury to life at home is light. While furniture pieces and flooring are the big-ticket items to bring luxury to life, picking the right lights bring out the distinct colors of terrazzo. White lights over black terrazzo with crystal-white chips make the crystals glow brighter and appear sparkling as you walk across the floor. Warm yellow light, on the other hand, gives white terrazzo tiles the right warmth to match wood. While it is tempting to stick to minimalist styles and singular themes to make the design feel more recognisable and familiar, it is striking the balance between edgy and rough that makes the luxury style stand out. Matching a typical rectangular dining table with a wave-shaped bar top, finished with precast terrazzo is an example of balance. There are many other ways to achieve the luxurious design at home. Matching Terrazzo with luxury need not be a task for designers alone. 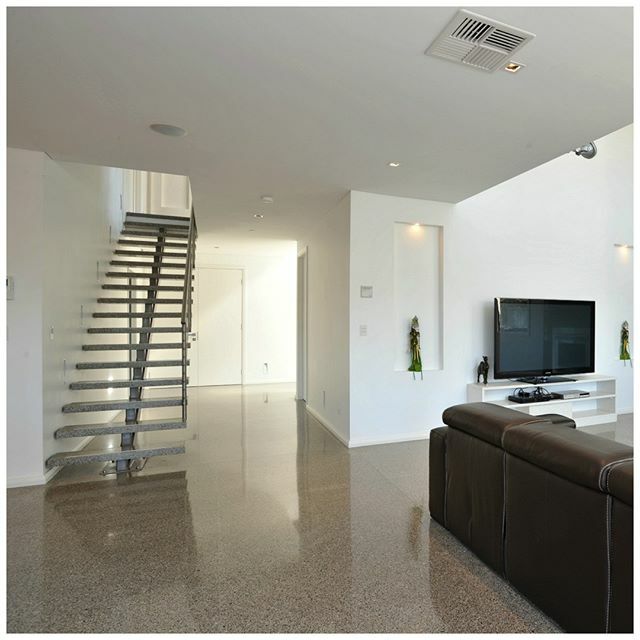 Check Terrazzo Australian Marble for your terrazzo options today.